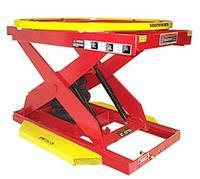 The PalletPal 360­ Air makes loading and unloading pallets faster, safer and easier. A heavy duty airbag automatically lowers or raises the platform as boxes are added to or removed from pallets. A turntable allows nearside loading and unloading. The unique design offers workers complete 360 degree access to loads. Because all of the units components are contained within the diameter of the turntable ring, there are no obstructions or projections to create "reach-over" zones found on many competitive unites. Designed for use where pallet loads vary widely and are changed frequently. The airbag spring combination provides virtually linear response, and the spring provides a measure of safety by supporting the unloaded turntable in the event of accidental air loss from the airbag. Fittings and tubing are simple with only two connections. The unit is equipped with fork pockets for easy relocation and to provide a stable base that does not require lagging. Low-friction bearing supported turntable for near-side loading and unloading. Portable - Requires no electrical power. Simply inflate the airbag with shop air or a portable compressor and use it anywhere. Fork channels for relocation by fork truck. Leveling feet (optional) allow use on sloping or uneven floors.